These sets have never been played with, just displayed. That is the only issue noted. No extra parts or pieces will be included. TMNT Out Of The Shadows. Assassins Creed. Phat Mojo Sets in Lot. 5 Total sets in lot. 100% complete. Excellent condition; Collector-owned and used for display only. 2014 TARGET EXCLUSIVE TMNT TEENAGE NINJA TURTLES MOVIE GROUP PACK 4 Signed! 2014 TARGET EXCLUSIVE TMNT TEENAGE NINJA TURTLES MOVIE GROUP PACK 4 Signed!. Condition is New please see pictures for any details! This was signed by the actor who played Donatello! Shipped with USPS Priority Mail. Teenage Mutant Ninja Turtles. Year: 2003. Teenage Mutant Ninja Turtles Figures Lot Of 8 Viacom Playmate. Condition is Used. Shipped with USPS First Class Package. 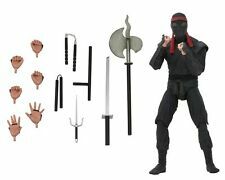 NEW RARE SDCC 2013 - Playmates Toys - Nickelodeon - Teenage Mutant Ninja Turtles - Shredder. Rise of the Teenage Mutant Ninja Turtles sticker sheets, Leonardo Role Play bandana and. Nickelodeon Teenage Mutant Ninja Turtles MONDO GECKO action figure. Condition is New. Shipped with USPS First Class Package. NEW RARE SDCC 2014 - Playmates Toys - Nickelodeon - Teenage Mutant Ninja Turtles - Comic Book Raphael. 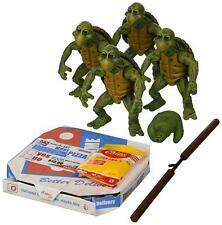 NECA Teenage Mutant Ninja Turtles (1990 Movie) - 1/4 Scale Action Figures - Baby. Condition is New. Shipped with USPS Priority Mail. 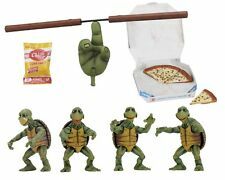 TMNT Michelangelo & Casey Jones 2" Action Figures Playmates Toys Nickelodeon . Condition is New. Some damage to corners of card as shown in photos. Excellent condition (see pics). 100% complete. T his is really adorable. Good addition to any Collection! Very nice, in clean condition ! NECA Teenage Mutant Ninja Turtles Foot Soldier 7” Target Exclusive PAIR. Condition is New. Figures Still In Plastic Bubble. Shipped with USPS Priority Mail. 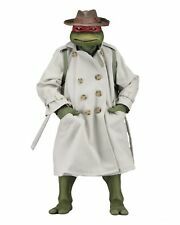 2012 Teenage Mutant Ninja Turtles Raphael With Helmet. Visor is missing. Good luck! Ripped Up Leonardo - Teenage Mutant Ninja Turtles. Was made by Playmates in 2004. TALES OF TEENAGE MUTANT NINJA TURTLES~SET OF 5 SAMURAI WARRIORS~2017 NIP~L@@K!! 2017 PLAYMATES TOYS - TALES OF THE TEENAGE MUTANT NINJA TURTLES - THE SAMURAI. FOR AGES 4 & UP. INCLUDES: RAPH, DONNIE, SHREDDER, TRANSFORMING CAR. FROM: PLAYMATES TOYS. LOT OF (4) TOYS. Doing that is against U.S. and international laws. IN VERY GOOD PRE-OWNED CONDITION. FROM: PLAYMATES TOYS. LOT OF (5) TOYS. Doing that is against U.S. and international laws. IN VERY GOOD PRE-OWNED CONDITION. HEAD DROPPIN' RAPHAEL. FROM: PLAYMATES TOYS. RELEASED IN: 2014. Doing that is against U.S. and international laws. APPROX SIZE: 11" TALL. FOR AGES 4 & UP. ITEM # 90620. NEW Nickelodeon Teenage Mutant Ninja Turtles TMNT Newtralizer Figure 2014. Condition is New. Shipped with USPS Priority Mail. SERIES: TEENAGE MUTANT NINJA TURTLES. FROM: PLAYMATES TOYS. RELEASED IN: 2014. Doing that is against U.S. and international laws. LOT OF (3) TOYS. Doing that is against U.S. and international laws. FROM: PLAYMATES TOYS. APPROX SIZE: 2" - 11 1/2" LONG. FROM: PLAYMATES TOYS. Doing that is against U.S. and international laws. IN VERY GOOD PRE-OWNED CONDITION. APPROX SIZE: 6" TALL. SERIES: TEENAGE MUTANT NINJA TURTLES. FROM: PLAYMATES TOYS. Doing that is against U.S. and international laws. Doing that is against U.S. and international laws. SERIES: T.M.N.T. APPROX SIZE: 5" TALL. TALES OF THE TEENAGE MUTANT NINJA TURTLES. THE SAMURAI WARRIOR HORSE WITH SAMURAI USAGI YOJIMBO. THIS ITEM IS NEW IN THE BOX. A GREAT LOOKING SET! AGES 4 & UP.